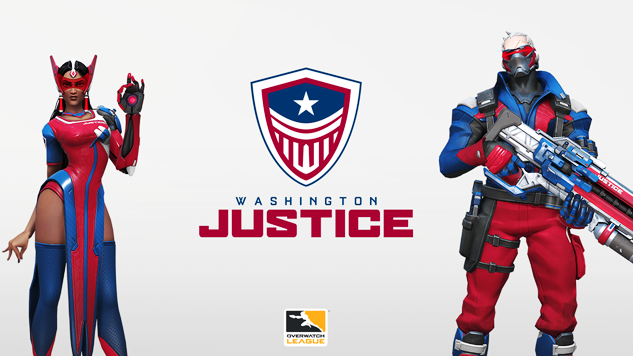 On Monday, the Overwatch League welcomed the Washington Justice as the latest team to join the ranks for the league’s upcoming second season. The team’s colors and logo, and an announcement video were posted via their Twitter account. It’s not a huge surprise that the team is incorporating American patriotism into their themes—the team will don red, white and blue, as you can see below. There is no region in the world that attracts more people to serve the cause of justice in government, philanthropy, academia, military service and the private sector than Washington. In fact, DC’s official city motto is “Justitia Omnibus,” which translates to “Justice for All.” As a team representing the broader DMV region, it was important that our team identity reflects a value that unifies all of our community members, representing the full diversity of backgrounds and beliefs. The Washington Justice’s logo is a shield that contains red and white stripes, with a blue section that has a white star in the center as a tribute to the American flag. The bottom of the shield forms a subtle “W” as a way to represent Washington, D.C, particularly the Washington Monument. Watch the team’s announcement video below. The second season of the Overwatch League will begin on Feb. 14, 2019.